Mid-market rent – is it part of your future? Come to the SFHA’s event on mid-market rent and learn more about this tenure. Whether you are a new entrant or active participant, this event will widen your knowledge of mid-market rent. In 2012, SFHA organised an event entitled: ‘Everything You Wanted to Know About MMR…But Were Afraid to Ask’. Five years later, the sector now has substantial experience of developing and managing this tenure. There appears to be significant demand for the product, and not just in high rental value areas, and homes developed for this purpose appear to be meeting a real demand in the housing market place. With the sector facing challenges to diversify its offering - what role does MMR have in meeting the legitimate aims and objectives of RSLs? • how can mid-market rent contribute to the supply of affordable housing? • if generation rent is here to stay, how can the sector best serve in providing professional management and maintenance services, affordable rents and high quality, low energy housing? The conference will be held at COSLA’s Conference Centre, conveniently located in the heart of Edinburgh, right beside Haymarket railway station. The delegate fee starts at £219 for SFHA members, which includes attendance, lunch and all refreshments. 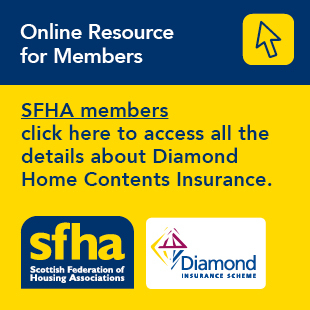 Book your place by visiting the ‘what’s on’ section of the SFHA website or contact the SFHA events@sfha.co.uk or telephone 0141 332 8113.